What does the dotted line in bottom left of the directional control valve mean? Why is a control valve with 5 ports used? Isn't one of the port on the left of the valve redundant and a 4/2 valve could be used instead? Why are there four ports on the actuator? I am only familiar with actuators with two ports (which would correspond to the top two ports). What are the bottom port and the right port used for? What does the symbol in the top right mean? What do the triangles on top of the lines mean? Why is one white and one black? I realize that these are a lot of questions. But as I said, I am new to this. I would also appreciate if anybody could link a free source, there such diagrams are explained systematically. So far I used the Wikipedia page, but there are a lot of symbols/subtleties which are not covered there. Browse other questions tagged circuits pneumatic diagram or ask your own question. What does this Logic Circuit do? How do you find “this” Vx in the given circuit? Do non-linear passive pneumatic throttles exist? What type of pneumatic valves would represent the valves in the schematic? How do you interpret a pneumatic regulator symbol? 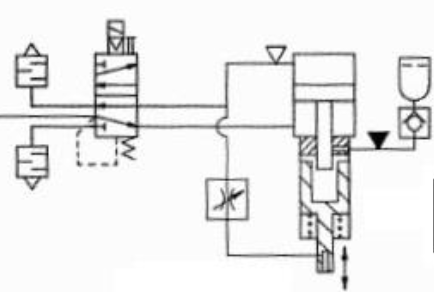 What is the “quick bleeder valve” in this tool changer pneumatic schematic (and other questions)? Is this Proportional Electro-pneumatic valve a direct replacement for other valves listed? How to prototype this circuit using an Arduino and breadboard?